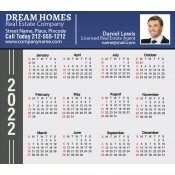 Real estate magnets are an inexpensive and effective way of promoting your real estate company! 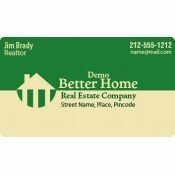 These promotional magnets are perfect for established and start up real estate businesses trying to push their business into the limelight and buy the attention of their clients. Full color advertising magnets make a brilliant promotional gift on all occasions because people would be happier to stick them over their refrigerator doors. Perfect for tradeshow gifting and bulk mailers. Avail free shipping anywhere within the Contiguous USA. Real estate marketing used to be an interesting affair for realtors because it brought them lucrative responses and deals. Today, “big rich real estate profit” has become a distant dream for realtors because people are reluctant to invest in the real estate. As a result, realtors are having hard time coaxing them to make an investment. Until some years back, the situation was that people were eager to call up a realtor, the moment they see an advertisement for home, land sale, or other real estate services. Post-recession the situation has changed and people are conscious to make right decisions. Also, realtors understand that situation has changed and they have to work hard to attract quality customers. This is why real estate businesses are emphasizing on personalized advertisements and striking personal conversations with their clients rather than keeping low. Most realtors understand that their business grows through web of referrals generated by word-of-mouth advertising. These promotional magnets would help them to reign consciousness of their targeted and existing clients, who may refer them to their friends and others. 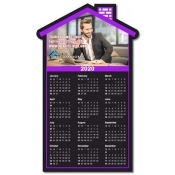 From real estate house shaped magnets to real estate calendar magnets to real estate business card magnets, we are here to help real estate marketers to achieve high value for their advertising. 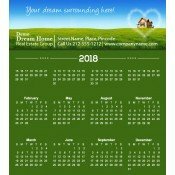 Our current selection also feature several types of magnetic calendars for realtors such as home calendar magnets and land calendar magnets. Our realtor magnets are created to offer maximum benefits to low budget real estate marketers. Whether offered individually or in combo, these custom magnets are sure to offer long-term benefits than any other low value promotional gifts. 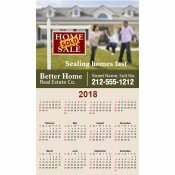 We offer inspiring wholesale savings for these custom real estate magnets and other advertising magnets. Our designing team can produce designs for any kind of real estate promotions -free of Charge! Save on art setup, online design proof, shipping and more. All our customized realtor magnets are 100% made in the USA are hygienic, lead-free. If you don’t see the perfect realtor/real estate magnet in our selection, feel free to give us a call at 855-762-4638 or write to us at info@cmagnets.com.